I’m so excited to present this beauty to you today. I announced this recipe last week and those of you who have read this post, you’ll know that it was my son’s birthday cake. It may seem like the ultimate “girl cake” but let me tell you the details. My son loves lemons and he also loves raspberries. He loves all things tangy and sour and they just happen to go so well together. As far as the poppyseeds are considered, I just couldn’t leave it as is. I had to add something textural and pretty to lift it to another level. They also happen to be a classic pairing. Haven’t you ever had lemon and poppyseed cupcakes or Muffins before? I have and there is something delightful about the two together. I’m also excited because it is the first time I’m sharing a recipe with aquafaba. I’m sure those of you are vegan are well informed and also know about the wonderful Facebook Group: Aquafaba-Vegan Meringue Hits and Misses. There are a lot amazing and creative bakers who are turning favourite animal-based classics into vegan delicacies. pavlova, lemon meringue pie, macarons and much much more….it all seems possible. I had a go at making meringues for the first time and I used this recipe just ommiting the beet juice and using raspberry powder to add a nice raspberry flavour to the meringues. Most of the meringues are not visible because I just used it to decorate the cake and the rest were happily eaten up by my three kids. As for the other elements, I was inspired by the beauty of spring at the moment. There is so much going on nw that I can’t keep up with all that is blossoming. 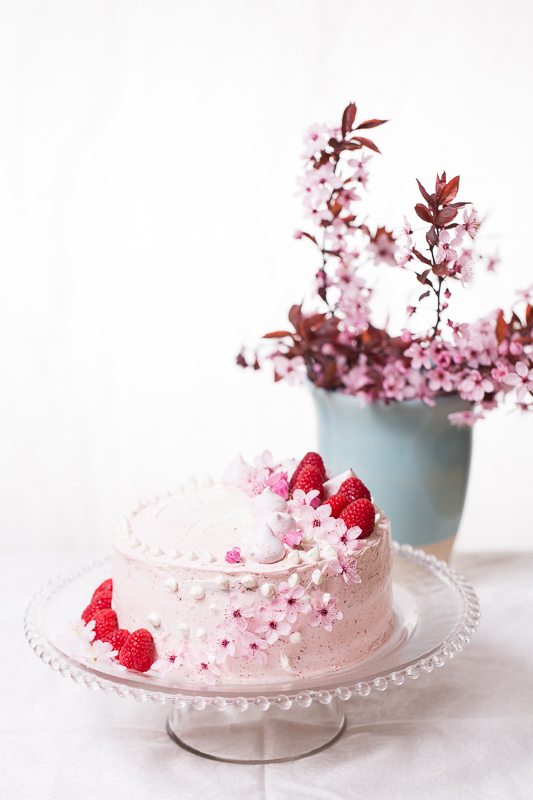 The blossoms that I used to decorate the cake are some kind of cherry blossom but I am not sure which to be honest. What struck me was the lovely contrast of the dark leaves to the pale pink blossoms. I am in sheer amazement each year what wonders nature provides us and it is so amazing how lush everything Looks. I especially love the fresh green of the trees. At first I thought this cake doesn’t look like a suitable cake for a fourteen year old Boy but seeing that there is nothing usual about Konstantin, I think it actually suits him perfectly. He is an absolute nature lover and passionate advocate for a vegan lifestyle. Just recently he said he can’t bear wearing leather shoes because it doesn’ fit with his ideals. So it looks like he is going to teach me quite a lot. I have expanded my vegan lifestyle to using vegan cosmetics and cleaning products but there are still many areas that I haven’t adopted to, yet. So let me tell you a little more about this cake before I move on to the recipe. 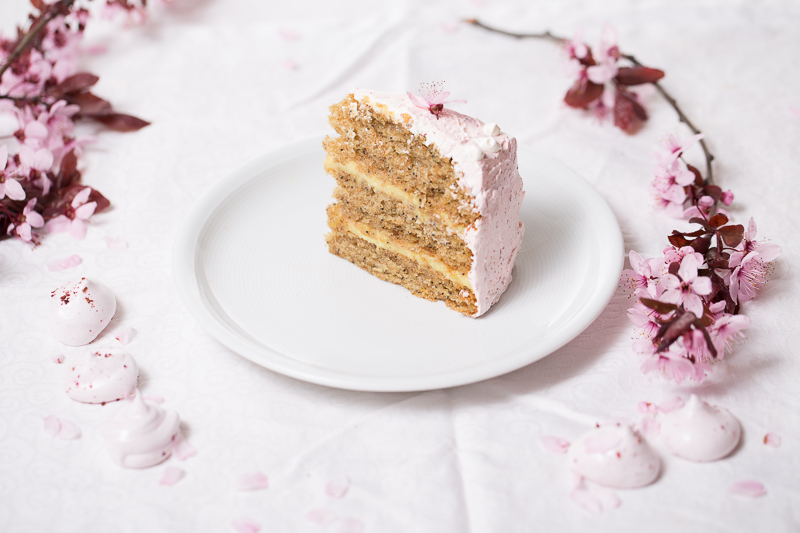 The cake base is a tangy lemon poppyseed cake and I filled it with a simple cashew-based Lemon curd and finished it off with a buttercream flavoured with vanilla and raspberry powder. In the winter or anytime out of raspberry season I tend to use either frozen fruit but recently I saw my local Supermarket selling freeze-dried raspberries and I thought I will give it a try. 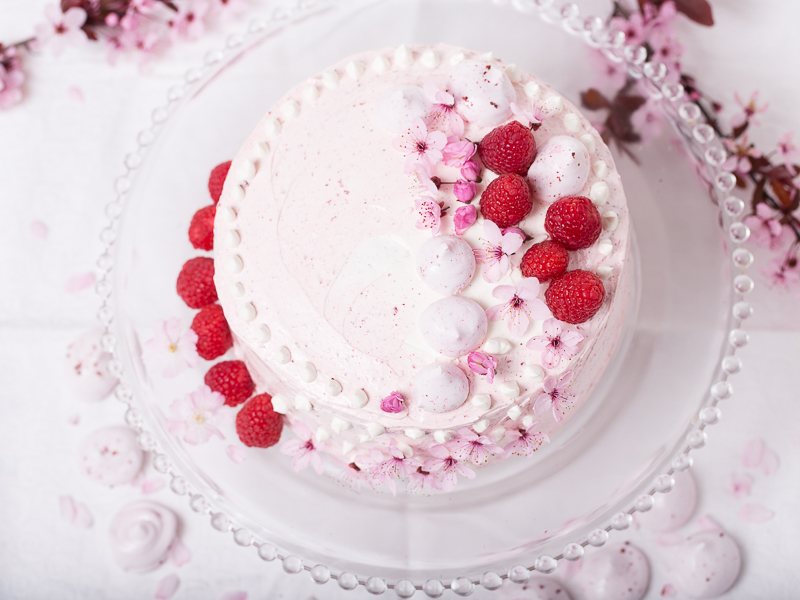 The advantage of using raspberry powder is that the flavur is more intense and you don’t add extra moisture which could spoil the texture of the buttercream. Since I have no experience in non-vegan baking and especially buttercreams I can’t judge whether it is similar in falvour or texture to a “regular” dessert but to be honest I don’t care. All I see is the reaction from non-vegans and others and I know that it is delicious dessert. Period. I would be so delighted to hear from you and if you happen to make this cake, please share with me or tag me on instagram #lemonpoppyseedcake #veganart. Start by making the cake, a day in advance is best so that it can settle and cool off completely. Stir the flaxseed with the warm water in a small bowl and set aside. 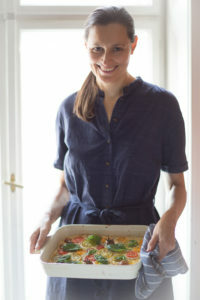 Preheat the oven to 180 ºC and line three 20 cm springform pans with parchment paper. Sift the flour with sugar, poppy seeds, baking powder, baking soda, arrowroot and salt over a large mixing bowl. Mix all the wet ingredients together until emulsified. Combine the wet and the dry ingredients and mix until completely incorporated. Divide the mixture among the three prepared pans and bake for 20 minutes or until the batter pulls from the sides and a toothpick in the middle comes out clean. Cool completely before putting the cakes in the fridge overnight. For the Lemon curd, blend the cashews with water and put the mixture in a pan with the remaining curd ingredients and bring the mixture almost to a boil stirring continuously. It will thicken quickly. At this Point take it from the stove and cool it off. When it stops steaming place in the fridge to cool completely. Carefully add the raspberry powder and using a spatula carefully add turn it into the meringue. Take a clean ziplock bag and spoon the meringue mixture into the bag. On the next day prepare the buttercream by letting the vegan butter come to room temperature. If not already made, make the powdered sugar by mixing it briefly in a blender. Whip the butter with the powdered sugar,vanilla and raspberry powder for a few minutes. Cool in the fridge for about 30 minutes. To assemble the cake, place one cake bottom and spread half of the lemon curd onto the cake. Place the second cake onto the first and put the rest of the lemon curd on this layer. The last cake layer Comes on top of the previous one and at this Point you can cool the cake again for 30 minutes. 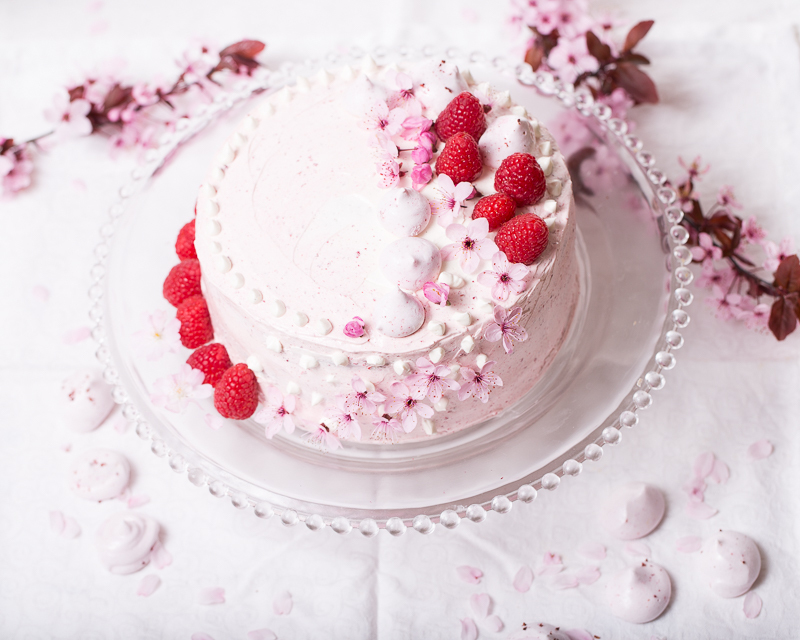 remove the cake from the fridge and rumb coat the cake with a light layer of raspberry buttercream using a long spatula. Cool again. 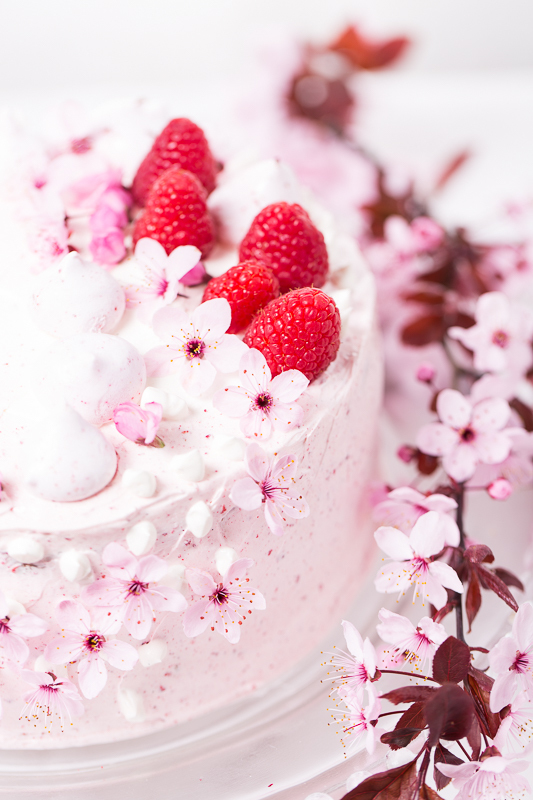 Now finish off the cake with the final layer of buttercream and finish decorating the cake with the meringues, blossoms and small little raindrops of buttercream. I used the same bag I used for the meringues. 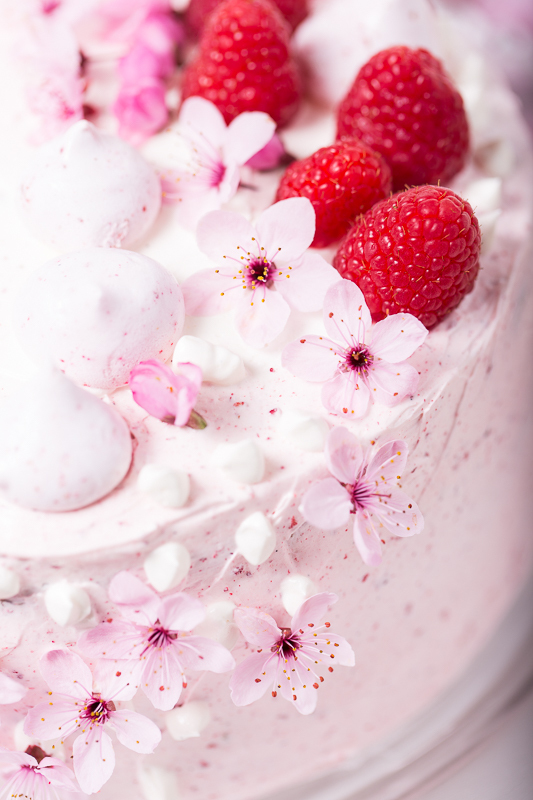 A lot of ingredients that are new to a Vegan beginner and labour intensive but what a delicious and beautifully decorated cake. Perfect. For a very special occasion. I am really impressed; I consider it is an original recipe. I look forward to trying some of the other dishes posted. Everything is very beautifully displayed as well.